Aqua Vitae is first mentioned in the Irish annals in 1405, when a chieftain apparently died of over-drinking the stuff. By the time of Henry VIII, it had moved from a wine-based distillation to a grain-based one. The name is a partial Anglicizing of the Gaelic “uisge beatha”, which, like “aqua vitae”, also means “water of life”; The Gaelic term evolved into what we call “whiskey”. Markham’s 1615 recipe for Aqua Vitae calls for “four gallons and more of strong ale, and one gallon of sack lees”, which, along with a large number of herbs and spices, is then distilled, also indicating a (mostly) grain-based spirit. Nearly all historical cordials and ‘waters’ required distillation, a process that is now illegal for home brewers. I was delighted to find this interesting entry in one of my cookbooks, and decided to give it a try. I have to preface by saying that while I am not a fan of licorice flavors, my husband loves them, so this is one his favorite things I’ve made. In fact, he liked it so much that I’ve had to make an additional batch to submit for judging, because he imbibed so much of the first! The flavors of the finished cordial, while interesting and varied, are overwhelmed at first taste by the punch-in-the-face licorice element on the front end. Brewer’s Notes: if you can use whole but crushed spices, such as cinnamon sticks and whole ginger, there will be less to try and strain out of the final mixture. I also substituted spikenard for the musk and ambergris- those are too expensive and rare even for my pantry! In a large jug or jar, combine the spirits with the spices and fruits. Cover, and either shake or stir at least once daily for ten days. The color will darken considerably as the mixture infuses. After 10 days, strain through a fine filter into a clean vessel, and add sugar to taste. The cordial is drinkable after the initial soaking period, but is far better after a month or more. Enjoy! 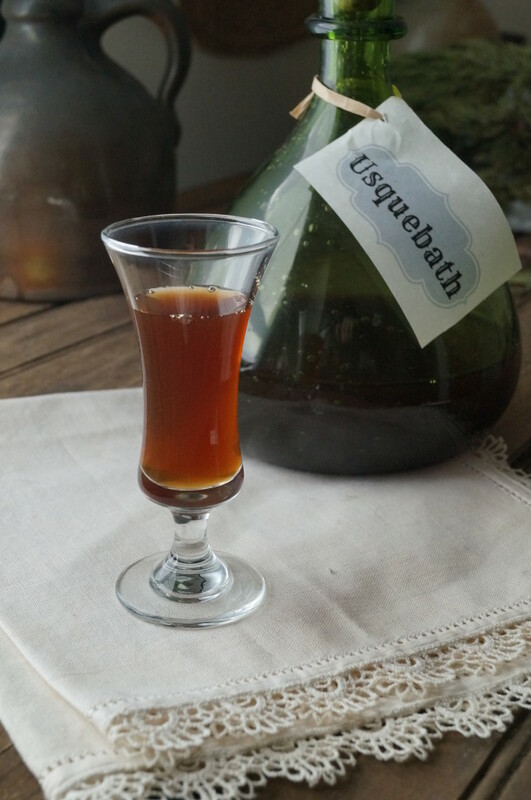 I can remember reading of uisgebaugh (or a similar spelling) in a medieval novel (Elizabeth Chadwick’s “Lords of the White Castle”) set in around 1200 or thereabouts – it’s referred to as being almost clear, fiery, and potent enough to (quoting here) “get one drunk without bursting one’s bladder”. It’s mentioned in other novels, too – mostly as a way to anaesthetise someone (ie. before taking an arrow from their leg or to drown the first days of wild grief) or having women compared to it…. I think that it was made much earlier than some written sources indicate – the Scots apparently made a honey version that was even more potent than the Irish stuff (which is described as being like lightning)!